I was supposed to give a presentation and trunk show at the Iowa City quilt guild last Monday. It was called off that afternoon with the threat of freezing drizzle in the area, but not before I'd prepared a presentation and prepped most of the quilts I wanted to show. 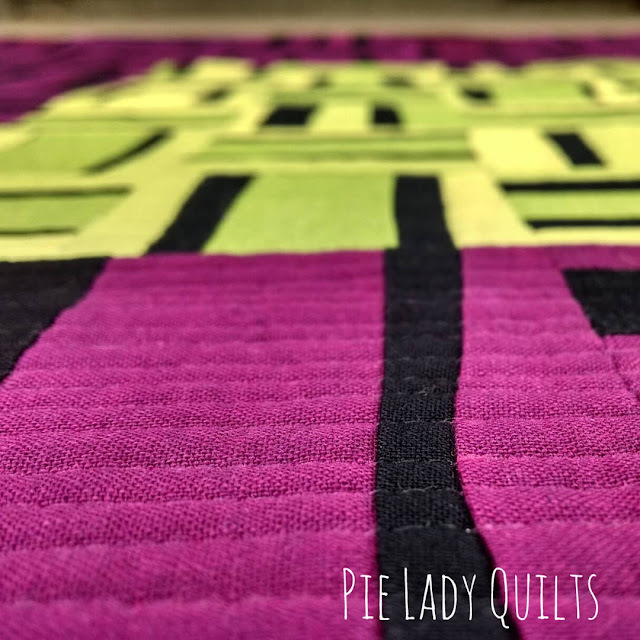 You can't help but be reflective when you spend a day looking at a few years worth of quilts and a lot longer than that thinking of what quilting means to you. My bio on Instagram is "I make, and it makes me happy." That's pretty much it. There's more, though. Over the Christmas holidays I was asked to speak about joy in front of our church congregation for about 15 minutes. I learned so much from that experience. I found a hymn with the lyrics, "You can make the pathway bright, fill your soul with heaven's light, if there's sunshine in your heart." Not only is that a beautiful way to define joy, it also perfectly encapsulates what the creative process does for me. As I make, I feel. 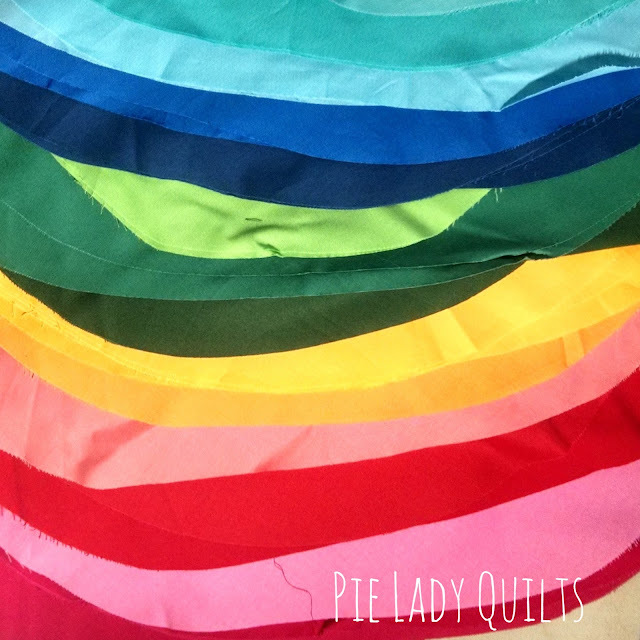 Those feelings are magnified, released and expressed with every seam I sew. Not every feeling is positive and uplifting. Learning how to master negative mental habits has brought me great joy and changed how I regard the world. 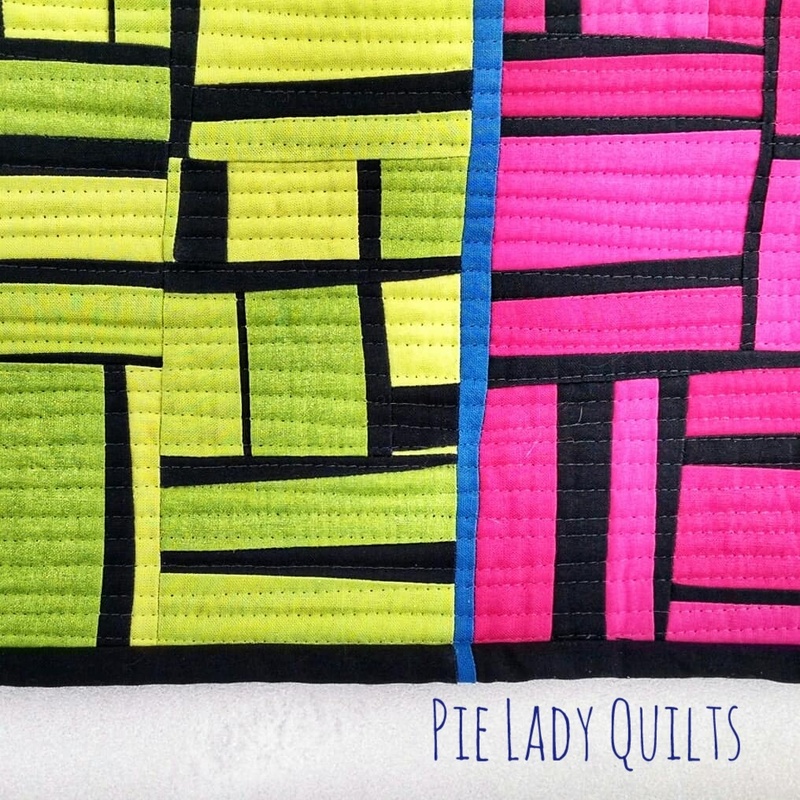 There is a point in EVERY quilt I've ever made when the destructive self-talk begins. Usually it happens in the beginning when I have just a few blocks up on the design wall. "I hate it," the voice says. "It's terrible and so are you. All you've managed to do is waste your time and materials. They won't like it." I've learned that I don't have to acknowledge that voice. Do you know how your eyes eventually slip out of focus once you've stared at a spot long enough? The power of the negative voice will slip as you stare at the design wall and consciously look for the good. There is always something good. A color combination, a shape...an idea to try next. Finding the good is incredibly rewarding. Finding the good gives you the tools to finish what you've started. Trusting yourself to find the good makes you brave enough to try again. In this sense, looking for the good isn't just a quilting philosophy. It's a world view. Once you've trained your eyes to look for the good, you see it everywhere. I've found so much optimism and grace in my sewing space. I've found healing. I've found joy. "How do you find time to sew with 4 kids?" (I hear this all the time.) I just do. I have to. I'm a better mom and a better human when I do. I would rather sew than sleep. We eat a lot of crock pot dinners. What else is there to say? There are things that I've done recently to increase my joy. I took a few steps to prevent the damaging "they won't like it" from taking root in my creative process. For now, I've stopped entering quilt shows. It's been a two year sabbatical so far. Stuffing a gag in that particular voice has strengthened my own. I see my work becoming more distinctive as I trust my own voice more than I worry about pleasing the other one. You have no idea how liberating it is to make things without the stress of wondering if what you make is good enough or modern enough. Or maybe you do and I'm just learning what you've always known. The other thing I've done is to wrest control away from Instagram. I took a two week break from social media last year and the world didn't end. Coming back from the break, I changed the settings so I wouldn't receive any push notifications. That flashing camera had become more about validation than sharing in a community. Those steps have helped me strengthen my resolve to be the quilter I want to be and to make the quilts I want to make. Modern quilting is many things to me (I'm still contemplating a lot of points), but I know for sure that it is an expressive act and a tool I use to make sense of my world. My journals are made of fabric and ether. The first quilt I'd like to share is a trading game quilt. I called it "Solstice." It is made from large petal shaped scraps I received from trading away a layer cake. I picked out the seven cool colors (discarding that darkest warm green for another time) and added 3 solids from my own stash along with a stripe and a plaid. I cut squares out of the center of the petals and used them for an improvisational stack and whack. I used the triangle shapes left over from cutting the squares out of the petals to change the distribution of color in the blocks. I enjoyed using the royal blue and green colors in the center of the block, but disliked the way they looked when using them as the framing triangles. The something good I saw when I put the first batch up on the design wall was the twinkly effect the lime green center gave the block. I left in the few blocks that I'd made with different centers before I made that discovery. I think it makes the quilt interesting. It is finished with organic, wavy line quilting in monofilament and a faced edge. It is 52" x 52." So out of the whole poem arose and wrapped me 'round an exquisite, silvery coolness. A delightful quality of distance and calm. 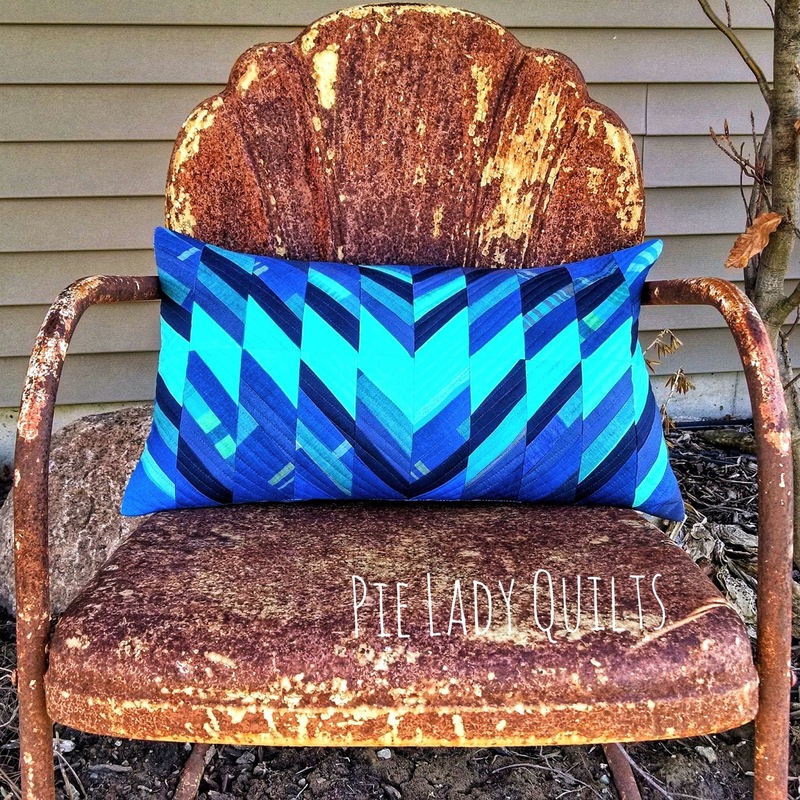 I had a bucket full of leftover strips and royal blue triangles when I finished piecing "Solstice." This pillow is what I came up with to utilize those. It is made from 20 improv string blocks (10 original and 10 mirror-image). It's hard to see because of the curve of the pillow, but all the royal blue triangles are the capstones to those rectangle string blocks. This pillow is 12" x 20." I like to participate in challenges to boost my creativity. 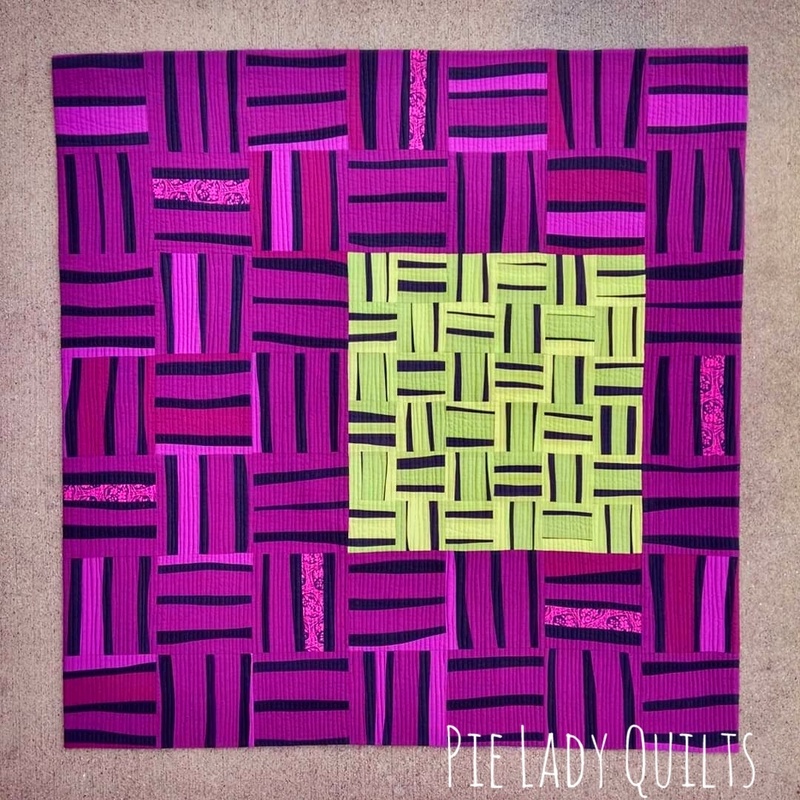 This mini was made for season 10, challenge 1 of Project Quilting. The theme was "Hope Springs Eternal." I changed course mid-way through. Originally I envisioned the flying geese to radiate out as arms in a plus sign. My thinking was that faith and charity go along with hope and that both of those attributes compel you to look outward and upward. I liked the idea, but it wasn't translating well in fabric. I tried rearranging the arms to all vertical and found my answer. I really like the idea of candles. I think they can easily symbolize the ideas of faith, hope, charity and joy that I was originally contemplating. I love how my subconscious was figuring this out for me while I was working. "Heaven's Light" finishes at 28" x 23." It is made entirely from my scrap bin (except for the celery background). 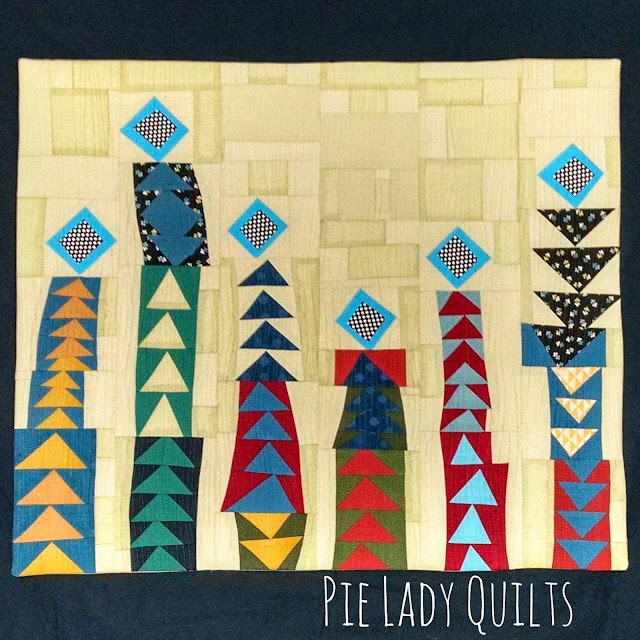 If you are interested in participating in Project Quilting, the next challenge was announced today. It is to make a quilt using only red, white and/or blue. It is due next Sunday. More details can be found at Kim Lapacek's blog, Persimon Dreams. I hope you'll think about giving it a try! There's nothing like some constraints and a short deadline to get your wheels turning! This quilt is a remake. I had some purple and black improv strips languishing in my closet that I was finally ready to deal with. 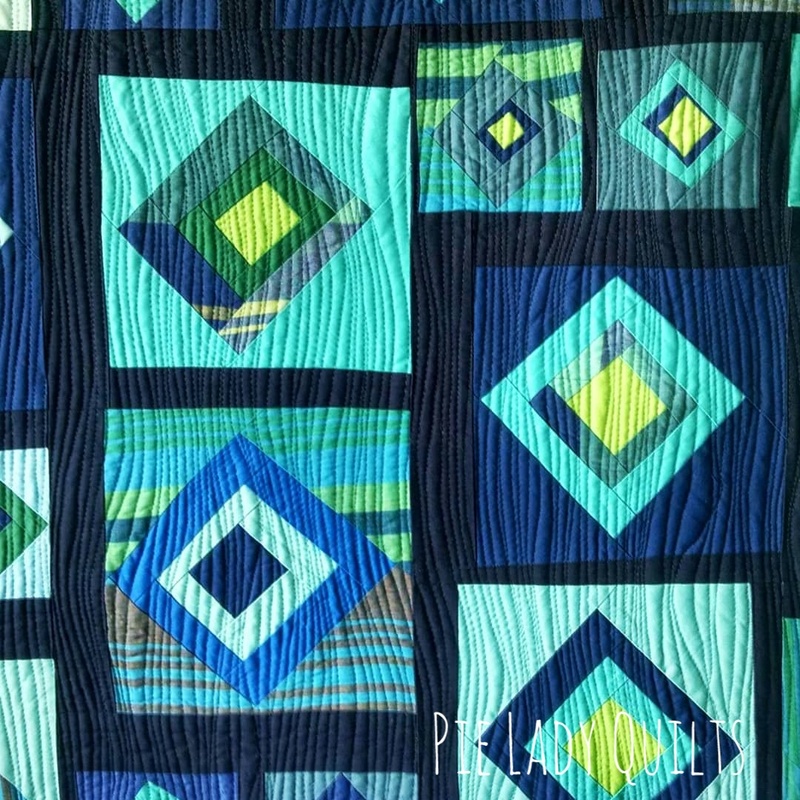 I had a version of a rail fence quilt in my last blog post and decided to give it another try. I made some poison green and black slabs to enliven what I had. I think complementary colors + black = a win every time. I like this. I like this a lot better than I liked some sad strips taking up space in my closet. "Riffing on a Rail, II" is 42" x 42." It is quilted with monofilament and finished with a faced edge. If the last quilt is a remake, I guess this one would be a remake of a remake. I got a little excited making the poison green and black strips and made too many. 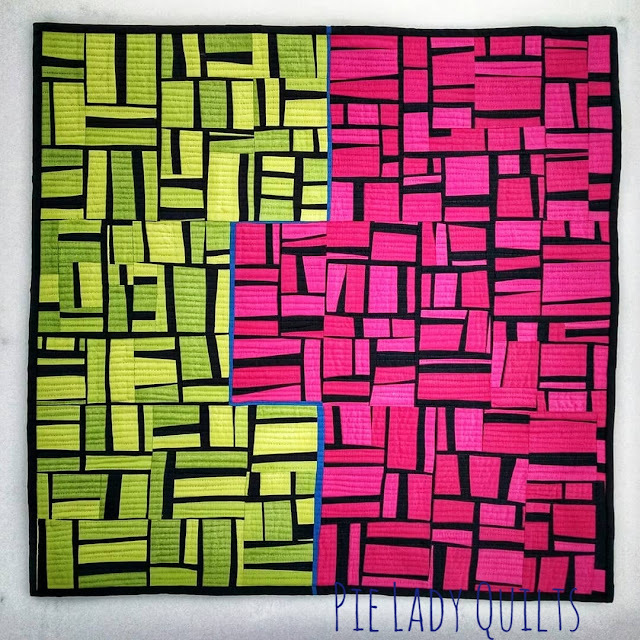 I didn't want to waste them, so I drew out an idea for this quilt. Recently, I checked out a book from the kid's section of the library called Paul Klee for Children by Silke Vry. I learned a lot from studying Klee's paintings. I can definitely see his influence on this quilt. Instead of the symbols he frequently used, I enjoyed experimenting with the placement of black lines. Sometimes combining the lines made shapes, sometimes piecing them together extended the line into a previously pieced segment. I was 100% engaged while I made this because it was so fun to watch what happened. The colors were inspired by an Elvis poster I saw once. The artist used a single blue curve to show the line of his iconic hair. I thought it would be fun to try in a quilt. That thin blue line is probably also the outer limit on my abilities in minimalism. 😏 There are three different greens and three different pinks in this quilt. The effect is subtle, but interesting. It was very hard to capture in a photograph, but one of the greens is metallic. "Riffing on a Rail, III" is 25"x 24." It is quilted with monofilament and finished with a pieced binding. 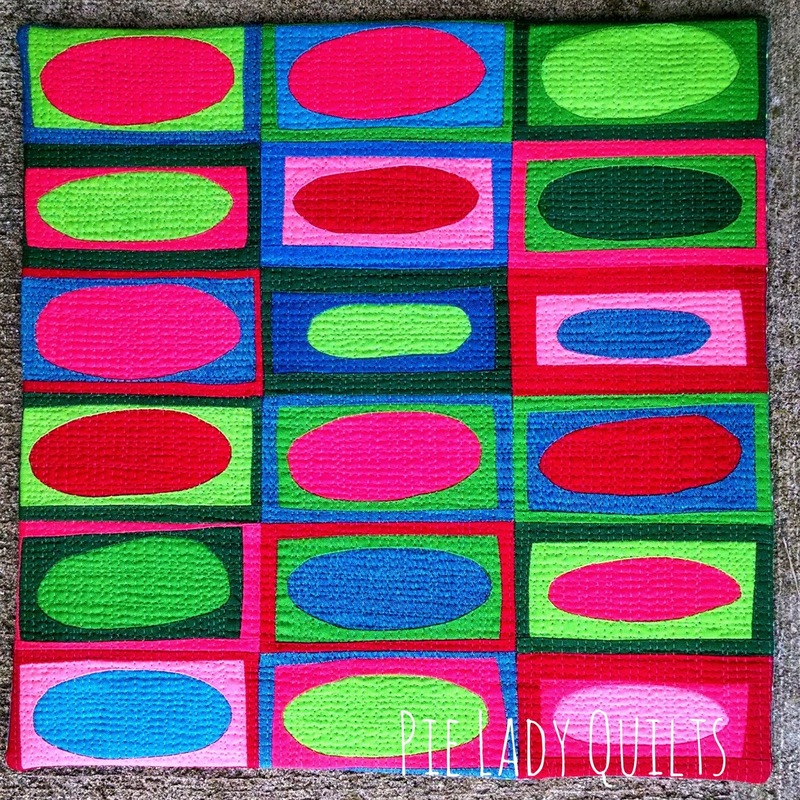 The last quilt, "Happy Little Ovals," was made for a Curated Quilts challenge. I really mean it when I say that I enjoy working with constraints. I've had figuring out Dale Fleming's Six Minute Circle on my list for awhile now, but it was the challenge that gave me the impetus to finally try. 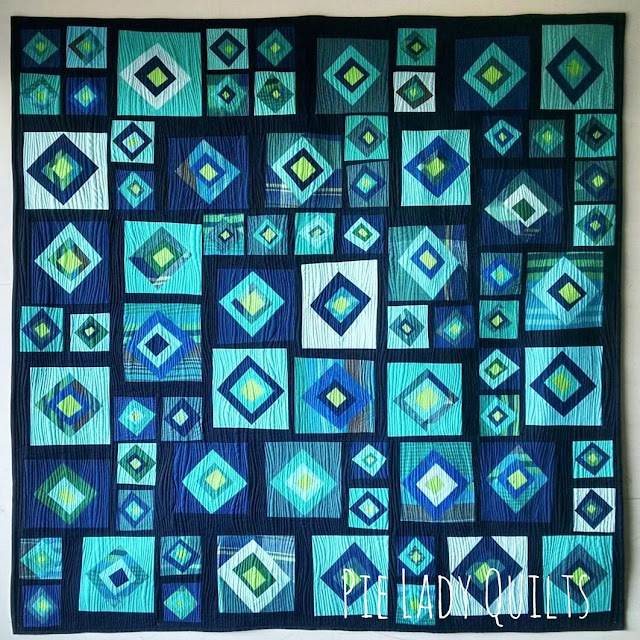 I've done all of the Curated Quilts challenges except for one that was too close to my due date. I've never had one be accepted for publication....until now. I was surprised. I would have kept making them for the duration because I enjoy it. I named this to remind me of a fun story. I took a stroll down memory lane and watched an episode of Bob Ross on Netflix one day. My Kindergarten-aged daughter walked in. She was in love. She sat down in front of the TV and didn't move until he'd finished the painting. When it was over she begged, no, IMPLORED me to let her watch another one. She loves to draw. I'm excited to see what she'll do as her talents develop. My presentation and trunk show have been rescheduled for September 9, 2019 at the Our Redeemer Lutheran Church in Iowa City. The meeting is on the lower level of the building and begins at 7:00 pm. Admission is free and anyone is invited to attend. I hope you can find something that gives you joy today. Thanks for reading!